It is often said that one reason casualty rates were high in the Civil War is because Napoleonic tactics of mass troop movements were used against defenders with better rifled muskets who could hit their target more accurately at longer ranges. There is an element of truth in this, but other factors did much to negate this effect, making long-range musketry no better than half a century earlier. Factors like the confusion of battle and the large amount of smoke limiting visibility meant range was not so important, and even with the best weapons, infantry were still trained to hold fire until the enemy was close in order to maximise the impact. Nevertheless the large majority of injuries during the war were caused by infantry musketry, and while soldiers were now unlikely to trade volleys at close range, the firing line remained the bedrock of any army. As can be seen the bulk of this set comprises 13 poses, there being three of each in a box. Almost all of these are at some stage in the process of loading or firing their musket, and we pretty much liked them all. Some of the more animated poses actually firing may be doing so on the move, since firing lines were static, but that is a perfectly reasonable pose to make. The reloading poses are largely a compromise of course, as such poses always are. 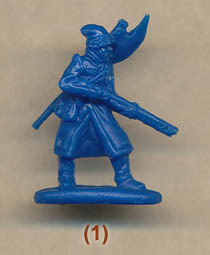 The proper reloading procedure produces poses that are very difficult to create in such figures, so most sets like this end up with men holding their musket at odd angles and positions. Without making complex multi-part figures this is always likely to be the case, and those here are as good as any. The single-pose pieces towards the end do not provide anyone firing, but do add interest and variety. We particularly liked the two-man piece in the fourth row, where a wounded soldier is paired with a comrade. It’s not the sort of piece you want lots of, so just the single one here works well. Next to it is a less appealing figure. His back is flattened, so he is actually flat on his back, but with arms and legs in the air. Presumably he has just been hit, and just fallen, so a perfectly reasonable pose and again something a bit different. The bugler and flag-bearer in the last full row are more conventional but all the more useful as a result. The two officers at the end are both dramatic as both are holding a sword in one hand and a pistol in the other. This kind of arrangement has been a favourite of some manufacturers down the years, starting with Airfix, but the reality is this pirate-type pose has very little to do with a Civil War battlefield. It would only make any sense if the men are ambidextrous (highly unlikely), and even then each weapon would hinder the use of the other. The second figure has the added difficulty of holding his sword arm across his body as he fires his pistol with his left hand. It just is not a pose you would ever see on a real battlefield. Those who have read our reviews of previous Strelets Union infantry will find we are repeating much of them here, for they share many characteristics. Every man here wears the frock coat with standing collar (but missing any sort of cuff). Many Union soldiers did indeed wear this on campaign, but the majority, particularly later in the war, wore the much shorter sack coat, so this set could easily have included at least half the poses in this garment. All of the figures, including the officers, wear the peaked fatigue cap, which is fine, so apart from the cuffs, which are a minor detail, the uniform is properly done if not the ideal choice in our view. Both officers wear a sash, which was unusual in the field but did happen, though there is no sign of the ends of the sash where they are tied. The flag-bearer and bugler are in the same garb as the rest of the men, and the bugler has no braid on his coat, which again was common but not universal. The men have a mix of equipment which is broadly correct but has problems in some details. The majority have a haversack on the left hip, but we thought most at least should have this very basic item. Everyone does have the standard circular water bottle, but as in previous sets this sits in the middle of the back held from a strap over the left shoulder, which is incorrect (it should be as per the box picture, on the left hip over the haversack). All have the cartridge box on the right hip, and most also have a cap pouch on the left of the waist belt. Both the officers have their swords suspended from the waist belt, which was normal, but strangely one officer and the bugler have a pistol holster hanging from a strap over the left shoulder. We have never seen this item of kit before, and can find no reference to one, so must doubt it as a result. We also wondered why the bugler is wearing his dress sword, and has a cartridge pouch, but only a pistol, which would not have been regulation issue. A variety of muskets were used by the North during the Civil War, and these models are not good enough to identify them here, nor even whether each is flintlock or percussion. They look typical however so are fine. Only a very few of the poses have a bayonet attached, which we found fairly surprising. Certainly the bayonet could slightly impede the use of the ramrod, and a soldier under stress and anxious to reload and fire as quickly as possible could even injure himself, but we would have thought that it would be fairly common to have fixed bayonets as a precaution when within range of the enemy. In any event, most of the figures seem to lack a bayonet scabbard, which is poor. Another feature of these Strelets sets is the small size of the flags and staff. The flag in this set is 15mm at the hoist (tall) and 18mm at the fly (wide). That works out to 110cm tall and 130cm wide, whereas a standard battle flag (national or regimental colour) was 180cm tall and almost 200cm wide. So too small to be a battle flag, but much too large to be a camp colour. The staff, including the finial, was 460cm long, but this one, which has no finial, is only 32mm long, which makes it 230cm to scale. The only reason the flag is as high as it is is because the bearer holds the staff high off of the ground. So the staff should be much longer, and it should have a finial such as a spear head or an eagle. Generally this set scores well. Although the uniforms are accurate they are not so representative and not what we would have chosen, and the poses are mostly very good considering all these figures are a single piece. The sculpting is also pretty good, with good proportions and no flash, and while detail is not quite as sharp as the best on the market, most customers will have little complaint. We have highlighted a number of small issues which together add up to some irritation, but fortunately do not seriously damage the set as a whole. Despite its imperfections these figures should mix well with those in other sets and help to create a very respectable Civil War scene.